Freeze-dried pet food is a fast-growing segment in the industry’s mass premiumization shift to solution-based, minimally processed diets. Pet parents increasingly are purchasing higher-priced limited-ingredient dog and cat foods, including freeze-dried food, toppers, patties and treats. In fact, freeze-dried pet product sales grew by 20% in 2018*. Consumers want healthy pet food, many seeking out products marketed as “natural.” They read labels and want ingredient transparency. They know their dogs and cats are carnivores and may be healthier with grain-free foods and treats that align with an ancestral diet. Freeze-dried food is checking the boxes on these requirements. Freeze-dried pet foods’ ingredients may include minimally processed meats, fish, fruits, vegetables and botanicals. They are naturally chemical-free and preservative-free, and their limited ingredients make them good choices for pets with food allergies or sensitivities. There are benefits to freeze-dried food beyond nutrition. Their long shelf life is a plus for consumers and retailers. While freeze-dried foods may seem like kibble, its nutrition is concentrated and less may be needed for each meal. Plus, freeze-dried is more portable and lightweight, making it attractive to pet parents on the go. Water is removed by placing the food in a pressurized chamber and freezing it. The food is not changed, and nutrients, vitamins, minerals, enzymes and protein structures are preserved. 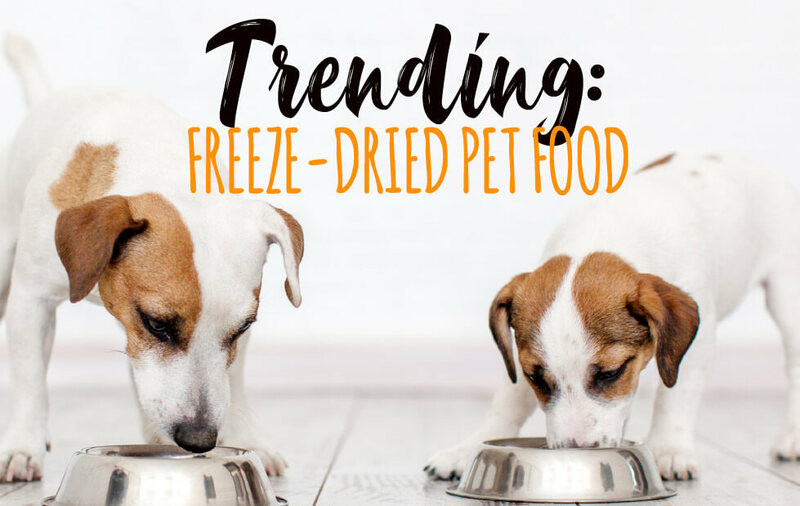 Feeding a pet freeze-dried food involves crumbling it and then adding water to it. Freeze-dried pet food has all the benefits of a fresh or frozen raw diet but is easier to handle. It could be called a “gateway” product to raw food. Once pet parents see the value in freeze-dried, they may step up to super-premium fresh or frozen raw food. For independent pet retailers, being able to educate consumers face to face about freeze-dried and raw is a differentiator. Sales staff must be experts in the benefits of freeze-dried and limited-ingredient nutrition and safety. They should be able to explain the freeze-dried process. Offering samples is a good way to introduce pet parents to a freeze-dried product, as is suggesting that freeze-dried be added to regular wet or dry food for extra nutritional value. For retailers, freeze dried’s popularity, longer shelf life and light weight make it an easy stocking decision. The products can be placed strategically throughout a store since freezers are not needed. Stock freeze-dried merchandise in the regular or alternative food sections, and place it with travel gear or supplements. Freeze-dried pet foods, toppers, patties and treats typically offer retailers a high margin. While freeze-dried food is at a higher price point than traditional kibble or wet food, the cost is not stopping the growth of this sub-category.